6 Ways to TurboCharge your Subject Lines! Email marketers know that subject lines are one of the most important elements of any campaign. In fact, 64% of people open an email based on the subject line alone. With so many emails flooding inboxes today, we spend a lot of time trying to cut through the noise to get clicks and conversions. In this post, I’ll show you the essentials you need to know to write high converting email subject lines. People have short attention spans, and subject lines are no exception. Research by ShowMeLeads found that short subject lines get better open rates than long ones. Another study found that subject lines with fewer than 10 characters had an open rate of 58%. So as a general rule, shorter is better. And don’t forget the fact that 40% of emails are first opened on mobile devices, which limits how much of your subject line will display (4-7 words). So if you want to make sure your subject line is readable by your whole audience, avoid unnecessary length. Opting for a non-descriptive, mysterious subject line might encourage the curious to click, but I don’t recommend it. Most people need an incentive to take action. Use descriptors in your subject lines that offer some value to readers. Words like “sale,” “new,” “video,” and “free,” are examples of value descriptors that boost open rates. I can tell you with certainty that people are trigger-happy when it comes to hitting the spam button. In fact, 69% of email recipients make that decision based on the subject line alone. Staying out of the spam folder should be a high priority for your email marketing campaign, so use your subject lines to convince people that the message is relevant for them. Hi Sarah, it’s Will from Sendlane. Jack, this software update’s for you. Happy birthday Lindsey! Here’s your gift. Personalized subject lines are easy enough to do with your Sendlane™, and they work wonders. Research has found that emails that have a personalized subject line are more likely to be opened. Even if your email subject lines are good enough to get clicks, getting conversions is a whole other task. The fact is, 95% of people who visit your landing page aren’t ready to buy. Conference registration discount ends tonight! It works wonders. Subject lines that convey urgency and exclusivity can get a 22% higher open rate.These might seem like simple techniques, but believe me, they’re proven strategies that can really pay off. Digital Marketer, for example, adopted email subject line best practices and managed to increase their open rates 3-fold. 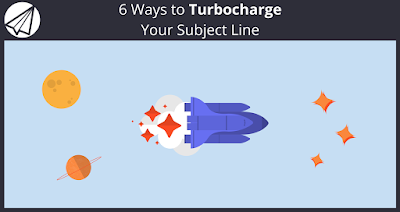 #DIGITAL: 6 Ways to TurboCharge your Subject Lines!